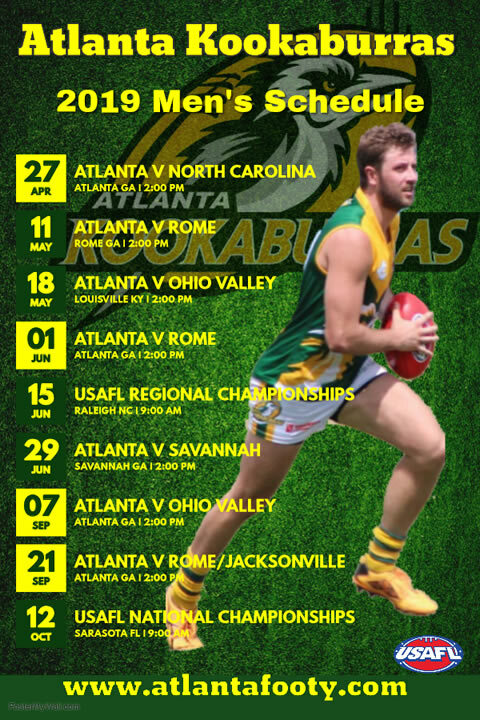 The Atlanta Kookaburras 2017 season games, all events commence at 2.00pm unless otherwise noted. 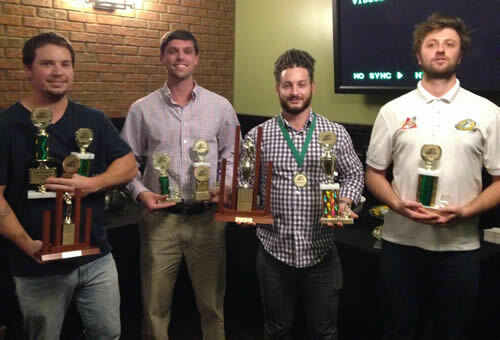 On Friday the Atlanta Kookaburras celebrated the 2016 season with their annual MVP Mike Powers Medal vote count and Annual General Meeting. Mark Cannatelli after a stellar 2016 took out the Mike Powers medal in front of a packed but well controlled crowd. Cannatelli traded the lead throughout the announcement of each games voting with good mate Brett Hester. Hester who has come along in amazing leaps and bounds in 2016 also had a fantastic year just fell short this year but we are sure if he continues to improve his medal is not far away. 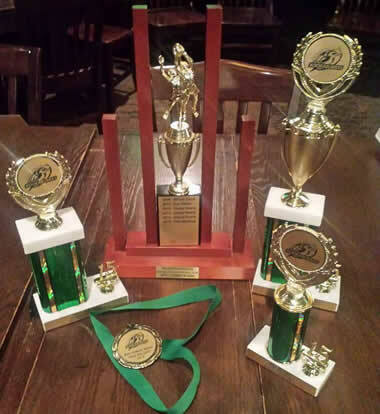 In the end it was Cannatelli's consistency across all games, missing just one for the year, to grab votes and he rounded out with a terrific finals series at the Sarasota USAFL National Championships to thoroughly deserve the MVP award. In third place was last year winner Paul Balding also best mates with Cannatelli and Hester meaning the 'GA Tech Boys' made a clean sweep of all the voting awards. Balding also won 'Best at Nationals' this year, for the second time running. Fourth place in the MVP was a tie with newcomer Mike Peek and Braden Medders who also has another great year and impressive final series. Also note worth was Sam Ridenhour who was awarded Best Clubman and the Coaches Award from 2016 Head Coach Brent Bacon. Ridenhour's commitment to the club, to training, functions and his teammates didn't go unnoticed obviously. He also made some signifcant contributions on the field as well. (He also picked up the new Skoal Award for admirable pregame enriched warm-ups). A new Board of Management was also voted in bringing many new people to important club administration roles. But more about that later. Right now congratulate Mark Cannatelli and all the award recipients for a great 2016 Kookaburras season. 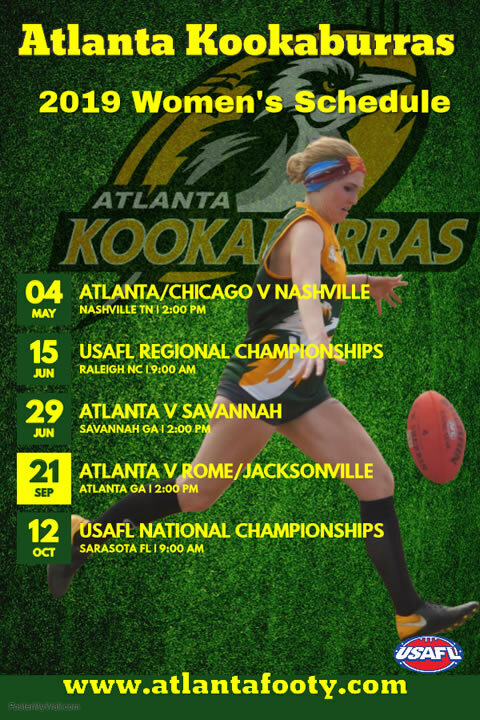 The Atlanta Kookaburras welcome you to come celebrate the 2016 season with the vote count for the MVP award aka the Mike Powers Medal. Other special awards will be presented plus some other fun awards. Come along and see the votes counted game by game, light food is supplied, Buy Your Own booze. Everyone is welcome and encouraged to attend. A new board will also elected for future success in the 2017 season and reports given regarding 2016. Cost: $15 for members $20 Guests or Spouses. Location: Hudson Grill, 4046 Peachtree Rd, Brookhaven. 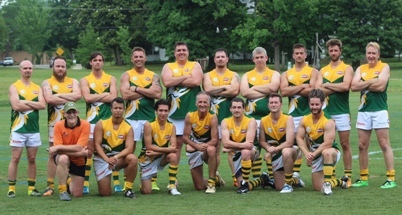 The Atlanta Kookaburras notched their 100th win on Saturday with a strong performance against the Nashville Kangaroos. Played under threatening thunderstorm clouds, the Kookas started steady and got stronger as the game progressed. Coach Bacon has the team disciplined and well trained. There was lots of shepherding, backing and hand passing to open up the game. Long kicking to position was the trademark of the Kookas win. Two events stick in this observer's eye. One was Kookas new guy Brian Gilliam, taking the center bounce, collecting the ball, taking one bounce and then slotting through a great goal on the run. Brian has really taken to the game and provides a strong influence all of the ground.